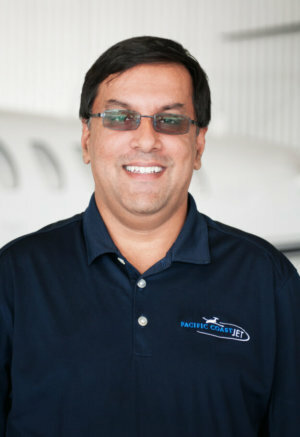 Adnan Jamil is now the full time Director of Maintenance for Pacific Coast Jet, a private aircraft charter and management company based in the San Francisco Bay area. Jamil is responsible for overseeing all maintenance for the company’s small to super mid-sized charter and managed fleet of aircraft. Jamil brings with him a wealth of experience from his former maintenance roles with Avantair and Axcess Aviation. He is a certificated Airframe and Powerplant Mechanic and also holds and Inspection Authorization. He is a welcome to addition to the Pacific Coast Jet team and will be integral in the continued growth of the company. Safety and reliability are the top priority for Pacific Coast Jet and all aircraft are consistently inspected and serviced in accordance with strict manufacturer’s standards and applicable FAA directives. Jamil has the expertise and ability to perform and supervise the accomplishment of a variety of necessary routine assessments in house as well as any other mechanical service required, adding capability to the operation and cost savings for owners. Pacific Coast Jet is committed to service and quality and keeping all aircraft in top condition is critical for the company. Pacific Coast Jet’s fleet includes a Citation Mustang, Citation CJ1, Citation Cj3, Citation Sovereign and a Phenom 300. These high performance, yet cost efficient private aircraft are ideal for the company’s most regular itineraries departing from San Francisco, San Jose, Silicon Valley, Oakland, San Jose and Sacramento to destinations all over the country. Pacific Coast Jet additionally has access to more than 5,000 aircraft worldwide with the ability to arrange planes and itineraries to meet any needs.